Mount St. Helens Hydrologic, Hydraulic, and Sedimentation Analyses (OR) | WEST Consultants, Inc. The 1980 eruption of Mount St. Helens deposited a debris avalanche of over 3.8 billion cubic yards of silt, sand, gravel, and woody debris in the upper 17 miles of the North Fork Toutle River Valley and another 50 to 60 million cubic yards in the upper portion of the South Fork Toutle River Valley. The eruption devastated approximately 150 square miles of evergreen forests, lakes, and wildlife within this area. 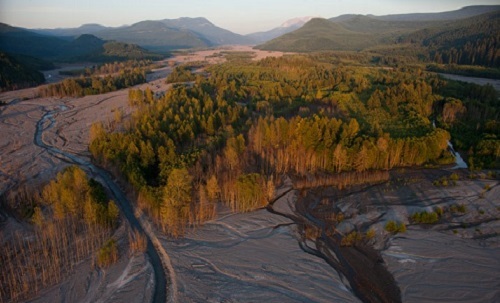 Mudflows, triggered by the eruption, carried large volumes of sediment from the debris avalanche into the Toutle-Cowlitz-Columbia river system and caused widespread flooding along the Toutle and Cowlitz Rivers and blockage of the Columbia River Navigation Channel. Sediment continues to erode from the debris avalanche and is transported down the North Fork Toutle River. The majority of this material now deposits behind a Sediment Retention Structure (SRS) that was constructed on the North Fork Toutle River in 1989. Since the eruption, the hydrology and sediment transport conditions of the affected watershed area and involved watercourses have been monitored intensively. A reassessment of the eruption-influenced sediment transport conditions was conducted to predict how downstream sediment deposition and the resulting flood risks may evolve through time. The reassessment considers that sediment deposition behind the SRS had reached the spillway crest elevation of the structure. The study provides basic physical and hydraulic data required for analysis of river management alternatives and compares the resulting sediment transport estimates to predictions made 20 years earlier. The expected impact of sediment deposition along the Cowlitz River over the next 35 years on flood control levees adjacent to the communities of Castle Rock, Lexington, Longview, and Kelso was also evaluated and requirements for maintenance of flood control was defined.